Throughout human history, there have been individuals who have given themselves over to a quiet, solitary way of life - to pursue knowledge, to surrender to a particular contemplative path, and/or to focus their full attention, life-force, and heart-mind to an artistic discipline. Those who consciously choose a solitary path hail from every religious tradition (or they may be non-religious), every culture (East, West; European, Asian, Latin American, indigenous), and every artistic discipline (ranging from the visual and material arts to the poetic). Regardless of the particular patterned way of life the solitary chooses -- and there can be a great deal of variation in embodiment and expression -- there also seems to be some core common denominators, including: working with silence, spending time in the natural world, modulating or minimizing contact with the human world in some way, and the development and expression of a unique artistic or poetic aesthetic that is unique to them while often radiating something familiar in tone from ancient tradition. Whether the solitary, cloistered life of Hildegard of Bingen in the Christian tradition, who was a prolific artist who painted her visions, Otagaki Rengetsu, a renowned painter, poet, and potter who blended elements of Zen, Pure Land, and Shingon Buddhism in her spiritual path, or wandering poets like Basho and Saigyo, the contemplative life lends itself to the artistic life, and vice versa. It is always my honor to have a dialogue with other “wayfarers” who embody an artistic-contemplative-poetic way of being in the modern-day...however their particular path may express itself. Recently, I had such a dialogue with Ando, a contemporary lay Zen poet from Portugal, who lives and practices in the same spirit of Saigyo, Basho, Santoka, Chiyo-ni, and Rengetsu. In this flowing interview, we emulate the way of flowing clouds and water - ever-moving, ever-reflecting, but never making things concrete and unmovable. Indeed, as you will see, Ando is sometimes hesitant to use labels for herself - even terms like “Zen” or “poet." But, undoubtedly, she is an artist, a seasoned contemplative practitioner, a wanderer, and a guide to others. NOTE: Throughout this article, there are a variety of names that, when rendered correctly and formally, should contain a macron above the letter i.e. a straight bar placed above the letter 'u' in the name Ikkyu, or a straight bar placed above the letter 'o' in the name Ando, Basho, Saigyo, etc. Due to forced text formatting, the macrons get stripped from names that should receive them, but which traditionally appear in Romaji Japanese. Also, throughout the interview, a variety of non-English words are used e.g. satsang, zazen, sesshin, etc. If you encounter unfamiliar terms, a glossary has been provided at the end of the article. 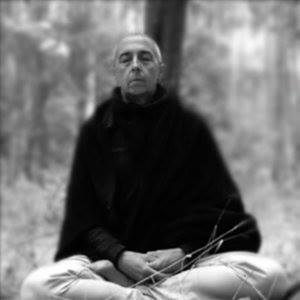 Ando is an artist and poet who has not only undergone in-depth training in Zen but spent many years living as a lay Zen forest monk in deep retreat. As an artist and poet, her poems express certain themes such as silence, stillness, working with heart-mind, and the human connection to nature. In addition to writing, editing, and designing a series of poetry collections, and actively developing poetry courses for a poetry community, Ando is writing a haiku memoir inspired by her forest years entitled, The Forest: A Haiku Memoir. More information about Ando's creative work will appear at the end of this article, with links. FO: Knowing a bit about your path and life journey, one of the first topics I wanted to discuss has to do with the solitary artistic life itself. Those who stand outside of such a spiritual or creative pursuit can sometimes misunderstand it. Part of that misunderstanding can be a muddling of different terms in association with it e.g. hermit, recluse. Modern media and even many dictionaries confuse the matter as well, often treating such terms as synonymous. What are your own thoughts about these terms ‘hermit’ and ‘recluse’? How do you relate to the terms ‘hermit’ and ‘hermitage’ given the unique path you have walked? ANDO: I find recluse the least relevant term, at least in relation to myself. It indicates withdrawal (from the world), but without any goal other than to avoid the world and evade revelation. For 5 years, I spent most of my time living in hermitage, but much of that time was hermitage in community, or with my partner, who lived that path with me. I don’t see this as contradictory to hermitage, but rather that I lived in communities of hermits, who sought to focus on the inner world, the inner journey, and so withdrew from the world for that purpose. This is withdrawal for the goal of inner work rather than withdrawal for the purpose of avoidance. I don’t consider myself a recluse, nor do I consider myself a hermit. But, I am drawn to hermitage, and am better described as one who is drawn to live in hermitage. FO: I know that you have been a wayfarer for quite some time in the Zen way, having studied with various teachers. When did you begin formally studying the Buddhadharma? Intrigued by his guidance, I searched for and found my first two Zen books, Zen Flesh, Zen Bones by Paul Reps, and Zen Mind, Beginner’s Mind by Shunryu Suzuki Roshi. I’ve carried Suzuki Roshi with me ever since, wherever I’ve traveled in the world. From that time forward, I sought a Zen master with whom I could meet in person. There have been a few teachers in my life’s journey, but it remains the case, even today, that Suzuki Roshi is my root guru. Less than a year after art school, I was drawn to explore other Buddhist offerings, as Zen was rare as “hares with horns” in England at that time. I found myself at the first London Buddhist Centre, in an old fire station in Bethnal Green, London. At that time, I explored the opportunity to live in Buddhist community with them, but something didn’t click. Now aged 56, there has been a long journey since age 19, with many teachers entering my life. The key teachers I have lived with, studied with, and served in these years have been Geshe Kelsang Gyatso, Julian Daizan Skinner Roshi, Mooji, Ananta, Ganga Mira, and Sokuzan. Regardless of the teacher and their background, I have continued to present as a Zen lay monk. I didn’t choose this as an identity, but it seems to have chosen me. I can’t really explain it in any way that might make sense. FO: Understood. That is a fascinating ‘Lineage Tree,’ as the late Chogyam Trungpa would call it. Could you reflect a bit about taking up the solitary life? ANDO: As far as the solitary life goes, I didn’t take it up. It was really more like it took me up. In 2000, I was a successful, ladder-climbing university lecturer, course director, and researcher, leading a Buddhist lifestyle. Quite suddenly, I became rapidly seriously ill, becoming bedbound and housebound for almost 7 years. This presented many challenges and pain, increasing until I was unable to sit much of the time, let alone stand or walk, due to vertigo and other symptoms. When I could, I would meditate, sitting or lying. I eventually increased my practice time, despite the pain and discomfort. I read and studied Dharma. But, the sickness got worse, and became prolonged. I could no longer hold a book steady, nor focus my eyes steadily, so reading Dharma became impossible to do for a time. My partner stepped in and would read the Dharma to me. I was grateful for that lifeline. It was this Dharma study and practice, the practice of mindfulness, which I now understand more broadly as Awareness, which saved my life. Of that, I have no doubt. When I look back now, I often call these 7 years “the zazen years.” It was like a 7-year Zen sesshin (Zen intensive). Socialising became impossible, due to my health issues, so a more solitary life began to form. I didn’t set out to lead this kind of life. Once I was well again, my partner and I acquired an old VW surf camper, and drove around the coast of France, Spain, and Portugal, north and south, in both directions -- twice. Before setting off, I named the van, “The Zen Bus", “Zen” for short, and the trip itself we called the “Zen Road Trip". The idea was that we had no idea where we were going, or what we were looking for, but only that we were looking for something and would know it when we found it. FO: This is fantastic. Reminds of Chofu Gary Snyder’s idea of the “rucksack revolution.” Wandering. Going with the flow. ANDO: Yes! We’ve traveled ever since. Initially, there were nomadic years from 1991 to 1994. I view it as cutting our teeth. That Zen road trip was life changing. Eventually, we had to let go of the van, as our region of travel grew and grew. My belongings got down to one checked bag, one carry on, a small collection of rare Zen poetry books, and a tiny tea ceremony kit in a wooden box. So, you see, this solitary life as you call it, was a partnership, a “sangha of two” as we called ourselves; traveling, sharing the Dharma with one another, our whole life focused increasingly on that. I became increasingly committed to a more monastic life, even in partnership, and am blessed to have a partner who has, so far, granted permission for me to ordain three times. Yet, I remain a householder, a Zen laywoman, a poet-monk by nature, and - by action - a monk of the heart, like many of the old white clouds of the Way. Yet, I still lived a semi-regular life - building websites to make ends meet, always traveling. A "digital nomad" before the concept was coined. "Van life" before the hashtag was written for the first time. Eventually, I found my Zen Master, Daizan Roshi, and trained with him. I walked with him and the sangha for a while. He trained us in eight meditation methods, with approaches to use them for health and well-being, and for insight. As time passed, I found I was only interested in practicing and teaching two of them - Bankei Yotaku’s Fusho (Unborn meditation), and Basso’s “Who Am I?” (self-inquiry). The rest fell completely away. No interest. I was like a dog with a bone for Fusho practice. Obsessed. I needed a living master of Fusho, of Bankei’s Unborn Zen. The funny thing was, there I was seeking a living master of Fusho, but I was already in his lineage. In fact, the mother temple of my lineage, in which I’m still lay ordained, is Gyokuru-ji, Bankei’s hermitage. Yet, I was pulled away by this obsession. I couldn’t see it there. I was like Bankei in his search for the true meaning of “Bright Virtue.” So, rather than following him, I was like him, without trying, totally possessed by the search that ensued. ANDO: Yes. I got really into heavy-duty zazen at this time. Hours a day. Usually 3 to 4 hours. But, I also practiced night-sitting. Rohatsu-sits were my favourite night-sits, along with day-long zazenkais, and 7-day silent intensive sesshins. I engaged in mostly self-motivated, independent practice, as I was so rarely near the temple in London, due to my wanderings. I led a small meditation group briefly, in a Buddhist temple in Menorca. It was a humbling time, and a treasured moment in the path. This quest for a master of Fusho (Unborn) continued. In time, I discovered the teachings of Advaita Master, Mooji, who had moved to Portugal from London. At that time, his teachings were very Zen-like, and he spoke much of the Unborn. Reading Bankei’s books, I found that his teachings were very satsang-like; all based on spontaneous talks and Q&A sessions. I dug deeper. It looked like I was onto something. FO: I’ve watched some of Mooji’s videos on YouTube. He’s very gifted. Direct when he needs to be. Soft when he needs to be. A big-hearted lion. A real mountain dragon in the river. I can see the parallel between his teaching style and what I’ve read about Bankei, who, like others, eschewed complicated sutras and koans and emphasized face to face teachings, spontaneous exchanges, and, essentially, the same kind of mind-transmission as Shakyamuni to Mahakashyapa. My own teacher, Kuma, was this way. I started thinking of it as "fierce-gentleness, gentle-ferocity." I almost couldn't take it at times. I told my Zen master about it, and that I not only wanted, but needed to go, to resolve this matter of Fusho. Much to my surprise, rather than say “Yes. Sure. No worries. Have a great silent intensive. I hope you find what you’re seeking,” he gave me three choices: 1. Do nothing. Leave everything as it is. 2. Agree to a short term period away, a kind of Zen sabbatical (For example, for 3 months). 3. Drop everything. I was stunned beyond belief. He totally side-swiped me with this response. Powerful to this day. I couldn’t answer. I had no answer. There wasn’t a choice, and there wasn’t an answer. So, I didn’t offer one. That was my answer, the answer of no-answer. Not even trying to be some clever Zennist. It was just how it happened. Before I knew it, I found myself on retreat with Mooji on a 7-day silent intensive. Dressed in my samue (Zen work clothes) and rakusu (a garment worn by Zen Buddhists who have taken precepts), carrying my bowls wrapped in their little black cloth, in a group of over 350 people, I was the only one in Zen regalia. But, I felt no oddness. No nothing. It felt the most natural thing on earth to be there. Just as on my previous sesshin with Daizan Roshi, a major shift occurred there. After the retreat, I found myself visiting Mooji’s ashram (hermitage) in the forest, and beginning to give service. I did some web design work, graphic design, and became his first ebook designer, later doing a little broadcast support work. After a short initial post-retreat stay, I found myself going back for more and more, until I found myself living there, and sometimes on the adjoining lands, in a couple of satellite communities. Mooji was my Bankei. He was Bankei. Totally. Thousands of people were showing up from across the world, at various times, for retreats, and to volunteer for helping build what is now a forest retreat centre. Back then it was a working ashram. Hard graft. Dust everywhere. Hot as hell in the summer days. A cold hell in the winter nights. Perfect. People living in tents and tiny wooden huts, myself included. Sometimes alone, sometimes with my partner. Whenever he spoke, giving spontaneous or formal satsang, we would gather, and listen. I remained a Zen Buddhist. It’s like it’s hard-wired into me from birth. The monastic thing, the Zen thing. The search. Bankei. Self-inquiry. I discovered that the other key teaching of Mooji, was Self-inquiry, as taught by Ramana Maharshi, the master of Mooji’s master. These two spiritual tools left me feeling fully armed for the search, and I was committed. Fully committed. I gave my days and nights to it. During this time, to make a few £s, I would do Zen coaching from my hut after work, using an iPad and mobile internet. Simple tools for powerful work. Coaching and mentoring writers, a lawyer, and a newly qualified Zen teacher, among others. The whole place was like an ancient, simple Zen monastic setup. In Bankei’s day, there was a hall for Dharma gatherings and Teisho talks by the Master. Monastics would live in tiny huts and shelters in harsh conditions (so much dust, so little water – half a bucket per day for bathing) in the forested hills around him. Thousands of them. More than around Mooji (at that time, it’s a little different now in scale). Mooji would also give his talks, and we were to gather immediately if we heard the horn or the bell, calling us to come, dropping whatever work we were doing, because nothing was more important than freedom. Nothing is more important than freedom. So, I lived this life for 3 years. First online, then just under 3 years, in person. FO: I get the image of the hermit communities one hears about from Red Pine (Bill Porter), or in the documentary Amongst White Clouds - Ch’an hermits living in the Zhongnan Mountains in China,...but with a bit of a modern twist. After your encounter with the Unborn through your time with Mooji, what were your next steps on the path? ANDO: There was another teacher, who overlapped for a while around 2014; an Indian teacher who was a disciple of Mooji’s named Ananta. I also served in his community, an online ashram with daily broadcasts of similarly spontaneous talks, with Q&As. Satsang had become my life. Yet, to me, it was still Zen. I was still Zen. I was born Zen. I can’t explain it. It makes no sense to me, so I don’t expect it to make any sense to others. FO: Makes perfect sense to me. It reminds me of something the late John Daido Loori Roshi once said. He was talking to predominantly American Zen practitioners in the Catskills, but the essence is the same. “You do not attain it. You were born with it. Zen did not come to America from Japan; it was always here, and will always be here. But, like the light bulb, electricity itself is not enough. You need to plug in the bulb to see the light.” So, it sounds like this deep work with Mooji and Ananta was the electricity; you were the bulb being plugged in. The light is the result. ANDO: ...and the regular retreats continued. 7-day silent intensives. Personal solitude. Always silence at the ashram. It was a silent life. In my own home, prior to moving to Portugal, as a sangha of two, we always kept silence in the mornings, all morning. It was powerful Dharma practice. The most powerful I have known. A truly contemplative life. Each day began with either a Dharma reading (usually me) from a book we were exploring, followed by a Dharma conversation, or a spontaneous Dharma battle. It was beautiful. FO: What an enormous gift; finding a partner who lives the contemplative life alongside you, practicing the Dharma. Someone who “gets” it, breathes it, walks it. I don’t know if it is rare, exactly, but it seems like the two of you have fashioned an utterly unique life-way; one that falls somewhere between householder and monastic. Where else have your Zen wanderings taken you? ANDO: Somewhere along the line, in the late spring into early summer of 2015, I spent some months living in Menorca, caretaking a small holding there with many animals. I tended a flock of very old sheep, ducks, chickens, cockerels, and some pet birds, too. Wild tortoises scuttled around the land. It was another powerful time for me, just as Mallorca had been. During this time, I entered an even deeper, more intensive practice period. My main teacher at this time was Ananta, through the online satsangs and online sangha, whom I was in service to. This period transpired into another opening and change. Spontaneously, I spent the last 7 weeks on the island in solitary retreat, working with the Christian mystic text, The Cloud of Unknowing, all the while still practicing as a Zen Buddhist. I’ve always been seeking my teacher you see. That’s why I’m also known as The Unsui...because of that ongoing search. FO: I’m familiar with the term unsui, but, if you would, take a bit of time to describe it for readers. ANDO: The meaning of unsui is twofold. It is a term specific to Zen Buddhism which denotes a postulant awaiting acceptance into a monastery, or a novice-monk who has undertaken Zen training. Sometimes they will travel from monastery to monastery (angya) on a pilgrimage to find the appropriate Zen master with which to study. The term unsui, which literally translates as "cloud, water" comes from a Chinese poem which reads, "To drift like clouds and flow like water.” Helen J. Baroni writes, "The term can be applied more broadly for any practitioner of Zen, since followers of Zen attempt to move freely through life, without the constraints and limitations of attachment, like free-floating clouds or flowing water." According to author James Ishmael Ford, "In Japan, one receives unsui ordination at the beginning of formal ordained practice, and this is often perceived as 'novice ordination.’"
The second meaning refers to Ch'an or Zen monks who, having achieved satori (enlightenment) after an initial period of training under their first master, take to the road in search of other masters. This is done in order to either test their awakening against them or deepen it with them. The term refers to their lack of a fixed abode during this period. FO: Clearly. Were there other teachers or communities you interacted with along your way? ANDO: For a time, I also visited and led meditations at a Thich Nhat Hanh sangha from time to time, in Brighton. However, the year before that, I had heard of a teacher called Ganga, who had been the wife of Papaji, HWL Poonja. I knew I wanted to meet her. I went to meet Ganga (known as Ganga Mira publicly). What a meeting! After that, I was with her from June 2015 to March 2017. I continued to have meeting after meeting with her. I would drive, sleep in the car on the wild cliff tops of SW Portugal, in a borrowed tent. I couldn’t stay away. It was not so much that I had to be there, as much I simply couldn’t be anywhere else. It was impossible!…and perfect. Ganga guided me so beautifully through this time when I needed guidance. I needed an elder of The Way to do that. Quickly, within a couple of weeks, I recognized I had met my Master. I spoke to her privately. Exchanged bows. I returned my name to Mooji (he had named me Bhagavati). She gave me a name; Kashyapi, after Mahakashyapa, the first of the entire Zen lineage, he of the Flower Sermon at Vulture Peak. During this time, following the Menorca retreat, and those months with Ganga, many experiences occurred. Timeless teachings, each one of them. There was another motive in meeting Ganga. One I only fully realized later: "To hide behind a master’s knees." The people who had been showing up asking for my guidance had come in increasing numbers. Suffice it to say, in going over to Ganga, rather than trying to walk along with a sangha, I was able to say, “No. Don’t come to me. Come here. See, I have a teacher. I’m nobody. Worthless to you.” I liken it to the custom in Zen when, following awakening, often a monk will be sent off to live in anonymity, under a bridge, to lead the homeless life, for maybe 6 years, maybe less, maybe longer. Sometimes, for a lifetime. I was like that. After meeting Ganga, I was miraculously granted a simple hermitage in exchange for caretaking several properties off-grid and deep in the forest, 4km from the nearest made up road or village. Wild boar, honey bees and butterflies for company. The moon, the Milky Way, nightjars, nightingales and owls, cuckoos, mongoose and all kinds of wild and beautiful things. All quite astounded to meet a human, so rare it was. I lived there with my partner for over two years. I had my own room, in which to practice (zazen and qigong/taichi) and write. In March of last year, following a heavy flu lasting a couple of months, which kept me from visiting Ganga, the caretaking position came to an end. And just as I had been so abruptly dropped into that particular phase of my forest life, I was withdrawn from it. I felt spat out. It was not by choice, not avoidable, and I gave myself to it with total trust. Then, my mother died. Life became a freefall. I discovered The Dark Night of the Soul. The bottom literally fell out of my spiritual life and path. I found myself with no teacher, no path, and no idea of what to do or where to go. Nothing would stick. Nothing was a fit. Nothing felt right. I was falling, falling, falling, in the great descent. Doubt like doubt never before. In everything. No faith. I paid no attention. I rode out the hell ride. I rode and rode. Surfing the black wave of loss. The spiritual loss, on top of, triggered by, the loss of my Mum, was more than devastating. It took everything. A more recent teacher, Sokuzan, came into my life a year ago, from a monastery in the US, and has accepted my Rinzai vows in his own lineage. I am touched and grateful for that, as he brought me full circle, back to the lineage of Shunryu Suzuki Roshi, and that of his Dharma Heir, Kobun Chino Roshi, who has deeply touched my life in recent years. FO: I've enjoyed Sokuzan's talks on YouTube. Very human, but a very precise human. ANDO: Yes. I’m now in a position where I can’t say he’s my teacher, and I can’t say he’s not my teacher. The only thing I can say for sure? Everything is my teacher. Everything is Buddha mind. The Dharmakaya. But still, I sit, not searching, but there is a constant meditation now. Awareness 24/7. To sit, is to sit in this awareness, not to develop it. What was a wild tumbling torrentuous falling, without end, last year, has become a different kind of ride now. Like learning to fly. Learning to ride the updraft when it catches me; the downdraft, too. So many words, but ultimately, I can say nothing at all of this matter. Better to say nothing at all. It’s all just spider silk on the wind. FO: A beautiful image. I have immense respect for the Dark Night of the Soul process you mention, having experienced elements of my own. It strips everything away. It’s harrowing. Truly harrowing. And yet, as painful, disorienting, and destabilizing as it is, it is ultimately purifying, liberating, strengthening. I wanted to turn our attention at this time to your artistic life and poetry, as most of our discussion has been specific to your Zen training and experiences with teachers. Not every practitioner of Zen takes up the Zen arts, or an artistic life in general. Did your visual artistry and poetry grow out of your Zen practice, or did Zen practice grow out of an already established life path of an artist? ANDO: I first wrote poetry as a child. I carried a little cahier with me, to note down poems of the land and sea. I remember some treasured moments with that notebook, but the treasure was always nature, the wilds, the landscape. Later, for five years at art school, I was often in trouble with the fine art faculty, for the central nature of my work being the written work, mostly poetry. I didn’t see the separation between poetry and fine art, but I was advised that I should have applied for a literary degree if I wanted to be a poet. I explained that I wasn’t a writer, or a poet, but an artist. For me, at that time in my life, “artist” was the closest I could get to a definition of one who was free, unbound by society, and its rules. I opted for the ‘Alternative studies department,’ which pretty much had only one rule – “anything goes”. We were creating music, sound art, performance art, installations, video, photography, but very much in the vein of conceptual art. They were magical times. I took it a step further by refusing to work in the studio of the department, asking for space in the painting studio, despite not being a painter. I proceeded to create installations there. One in particular caught the attention of the sculpture department, who showed up to do a group critique with me. In other words, I was an alternative studies student, working in a painting studio, being critiqued by the sculpture department. There was something unique going on. That’s still my best answer! Words started to appear in my work shortly after. Poems and small gift-like handmade artist publications that I would create and give away. I’m pretty sure there was a time when my poetry drove everyone mad. I couldn’t help myself. I was told this was art school, not literature school, but I couldn’t change the trajectory I was on. The poetry went underground for some years then, arose during the time I was sick for seven years. It helped keep me sane during that time. Haiku was what I began to write, and I also painted, as I got better and had the strength to sit up enough to paint. I was inspired by the paintings of Fabienne Verdier, and got hold of a copy of her book In Love With the Way, which was a collaboration of works inspired by Chinese poets of the Tang Dynasty. The words caught my attention. Some lines in that book continue to catch me in that way. Like sabres of mist and clouds, they cut to the root. I have taken that little book everywhere I go ever since. I never travel without it. It’s a funny thing, a love affair. I sometimes wonder about myself living up in those high, misted peaks, the rain dripping down, gathering herbs, sitting under the moon, conjuring up enlightenment poems. I wonder, I have already done these things, this lifetime, previous lifetimes, seeing the joke of the idea we have “a lifetime” or “a series of lifetimes”. All quite ridiculous. One brilliant line in that book is “Shh, don’t wake the sky people.” I don’t know what it is, but the feeling is that I’m one of the sky people. I can’t explain. Could I answer these questions without words? Or in a haiku or a fragment? Yes. FO: For those of us who work closely with Zen and the arts, we are inheritors of a rich nomenclature of philosophical and aesthetic terms. Some of these terms, such as wabi-sabi (acceptance of transience and imperfection), have become more well-known and have begun to capture the Western imagination. Other terms, like fuga ('life elegance' - described by Basho as “being a companion of the seasons”) are less well-known. In your own practice, are there particular aesthetic or spiritual concepts that are your primary anchor points of practice or creative expression? ANDO: I may be a heretic in the world of poetry. Zen, too. I don’t follow philosophies. They’ve never interested me. No school sticks with me. It’s why I struggle if I try to form a school, because I can’t define what I do. There are people out there who want me to found a school of poetry, but I can’t teach them a thing! I don’t know anything about poetry. Nor do I know anything about Zen. I can barely remember the four noble truths. I know there are the six this and the eight that, and maybe the ten the others, but I don’t know what they are. My memory has no capacity for such things. So, there’s been only one singular path I’ve been able to follow. My own. The untrodden path. Unmapped, yet loving and friendly. I wonder if that means I am wandering like a rhinoceros, to paraphrase one of your favorite sutras. Can I tell you a secret? I’m not a poet. I pretend to be. Some years ago, when I was posting a lot of my earlier material on Facebook, a friend (now a patron), kept referring to it as “poetry.” My poetry. She referred to me, therefore, as a “poet.” I never bought the terms, but I did adopt them. ‘A good cover,’ I thought; one that will pacify the ones who come delving deeply, looking for explanations, answers and definitions. But, I’m not a poet. I’m not even a Zen woman. No description matches me. Nothing will fit. These terms are just the nearest approximation I have come across. FO: Duly noted, and understood! That said, it is clear you draw inspiration from as stream of sources, and the life example and poetic expression of various types of poets and spiritual figures in history, much as Ryokan Daigu (1758-1831) drew inspiration from Hanshan (9th-century), and Basho (1644-1694) drew inspiration from Saigyo (1118-1190). Among the vast array of contemplative artisans who precede us, who feels like your “etheric teacher", your creative mentor? ANDO: If there is a singular teacher in this realm for me, it must be Basho. If I were to propose my whole poetic lineage, it would be Saigyo, Basho, Chyo-ni, Ikkyu, Issa, Santoka, the wanderers. I’m also very struck by the haiku of Zen Master Soen Nakagawa. The Chinese poets came later, Ryokan too. Now, I find myself walking in their mists and mountains, lost in their forests, too. If I propose the three elements that appear to make me up, they are Dogen, for the love of Zen and ultimate truth, Baisao, for the love of tea and conversation, Basho, for the poetry. But, actually, the bottom line is my lineage is that of mountains and rivers, forests and trees, wind and the moon, all wild things, life itself. Is there a better teacher? A higher one? I haven’t found one yet. FO: Indeed! Speaking of nature, I know that we both share great love of the Tao-influenced, nature-honoring Ch’an poetry that flows forward through time from the mountains of China. The carefree, easy-going way of idleness in mountains and forests feels like second-nature to me. There is another feature of some of these figures I find quite compelling and of particular relevance today, and that is how many of them felt at odds with the cultural life and political strife around them. Whether government corruption, war, or religious fundamentalism, some of these poet-ancestors’ response to these conditions was to draw even farther to the edge of things, while others took up the mantle of activist-poets. In what ways do you feel this poetic tradition is relevant to our own times? ANDO: I believe there is a lot of potential for it. To be defined as a contemporary poet, means to live in the here and now, to write in the here and now, to address and report on the here and now. FO: I’m curious about daily rhythms when it comes to your way of Zen and poetic practice. Do you have a particular flow or set schedule when it comes to the heart-mind practice of zazen/shikantaza/silent illumination, working with landscape and nature, and contemplative poetic expression? ANDO: I wake, I sleep, between these two, life flows. 24/7 is my meditation. Awake or asleep, silent or speaking, still or moving. I have beautiful contemplative practices, too. Some mornings I hold a chanoyu (Japanese Tea Ceremony with matcha tea), cleaning the space, picking a flower. Other days I offer leaf tea and incense. Another time, I may rake leaves from under the trees, or sweep the path. Daily, I clean the surfaces in the kitchen. Queueing for bread at the bakers. Choosing fruit at a street market. Sitting in meetings. Answering questions for interviews. For many years, since 1982, I meditate; daily since around 2000. Hours on end. Zazenkais (1 day sits). Sesshin (7 day sits). Rohatsu (night sitting in celebration of Buddha’s Enlightenment day). Mountain sitting. Night sitting. River sitting. Sitting under trees. Sometimes it seems like I must have tried every meditation posture, every possible technique, every duration, every location possible. At some point, I didn’t give up; I just discovered that all meditation practice was occurring inside meditation. Meditation isn’t a practice at all; it’s connection with the source. We’re never disconnected. We just get a little (or a lot) distracted. I also walk in nature whenever I can. The wild expanses, the open landscape, the dense forests, mountain ridges walked for days -- these are the places that light me up. They often inspire, invite, or offer poetry. The walk itself is poetry. The poetry comes at any time, though. and sip it on a rock, than listen to me. and get your head blown off, than listen to me. Better to contemplate where the breeze comes from. FO: Lately I have been re-reading two works that promote the idea of solitary living - the Khaggavisana Sutta (a.k.a. The Rhinoceros Sutra) and swordmaster Miyamoto Musashi’s (1584-1645) Dokkodo (The Way of Walking Alone). The approach and worldview of these texts will strike most modern people as too extreme. While I do not practice their essence as a city-dweller, undoubtedly there is something powerful about them, especially when considered against the backdrop of a world that seems to have fallen into a perilous state of disharmony, culturally and ecologically. Are you familiar with these works? What is your own takeaway? Are there other texts or tenets you find guiding your path as solitary practitioner and poet? ANDO: Since you shared about The Rhinoceros Sutra, it captured my attention immediately, like a brilliant light. I explored it. I recognized it. I recognised my path in it. I recognized it not as guiding me to a solitary life, but to be solitary in my determination, solitary in finding the way, to walk my own path, not to follow, nor to lead. Simply to walk, alone, like a rhinoceros. I took a peek at the Dokkodo. They seem rather beautiful, and no doubt helpful, but 21 precepts is too many for me. It seems I had to find another way in my own life. Not by choice, more by destiny, if I were to believe in that sort of thing. My memory was affected by my seven-year illness. Whilst many aspects of function returned, areas of memory function did not. It was my longest sesshin ever, those seven years. I am not troubled by the lack of memory. I find it a blessing! So, I can’t always remember the Four Noble Truths,...the 6 this, the 10 that, the 21 the other… Like the Tibetan monk Lam Chung, sometimes I can’t even remember a single line of Dharma. Yet, I hear it in every heartbeat and the breath of the wind. Sometimes when I speak or write poetry, it speaks through me. These aren’t my poems. This is not my Dharma. I belong to it, not the other way around. Everything is Buddha Mind. FO: I wanted to turn now to your Patreon project, because this is one of the pristine ways you radiate Buddha Mind. I have to say this is one of the most unique things I’ve ever seen a poet do. Not only is it a platform through which you are publishing some incredible nature-inspired, heart-mind cultivated, silence-infused Zen poetry, it’s also a way for fans of your writing to serve as patrons of your solitary life. Share a bit about the inspiration for The Unsui on Patreon, and where you feel this unique project is going. ANDO: I find it quite striking that you say my Patreon is one of the most striking things you’ve seen a poet do. In actuality, I didn’t do it. It was gifted to me by my first patron, you could say. Someone who had come to me for help with some aspects of life, and whom it seems I was able to help. So, bearing in mind that I didn’t come up with the idea, let’s talk about it. I have lived solely by donation for many years now. Sometimes I have gone without food, water even, and, of course, money and housing. I have lived in shelters, huts and tents, tiny cottages and luxury mansions in this time. All the shades of a life, lived. The Patreon came at a time when funds were at their lowest, February 2017. I say “lowest.” There was none. Somehow, word got out. Sangha began sending donations, others pushing €20 notes into my pockets. Monks sent PayPal across the oceans, and a friend showed up pressing this Patreon on me, saying I should try it, and that she would build it. I said no. She persisted. I said no. She persisted. I said no. She said “Make this easy. Say yes.” I said yes. It felt awkward and alien at first, and not a match for me at all. But now, it feeds me. Now, it is growing. It has continued to grow since day one. I discovered there were people out there who supported what I am doing, whatever that is. We can call it poetry, for the sake of naming it. So, it’s been the most incredible, path affirming patronage, both the initial gift of the Patreon, and the showing up of other patrons there. So Patreon is a place where a community has formed around my work, you could call it a sangha (of Zen poetry), a gathering of those who share the same spirit, seek it, or who simply wish to help feed and shelter me. I walk this path with great joy. If I am to trust the ultimate truth, the universe, the one, the absolute, life, then I must trust wholeheartedly. I could have surrendered to it, but that wasn’t necessary, because rather, this path came along, and swallowed me whole. I don’t need to stick my head in the tiger’s mouth, when I’m in it’s belly already. That would be a step too much. There are a set of clear and simple goals for the Patreon fund now. It began as a digital begging bowl, along with the donation page of my website, which has been around for a few years now, serving me food and water now and then. The first goal was to raise enough to put food, water and medicines on the table. I have long term chronic health issues (ME/CFS: myalgic encephalomyelitis and chronic fatigue syndrome), so need to maintain a good diet, and supplementation, with herbs, minerals and other therapies when needed. This goal has been attained, although I may have set the bar a little low, in actual fact, it probably needed to be a little higher to cover health needs. The second goal is that once I have $500+ coming in, I will be able to begin to set aside a little each month towards buying a vehicle. The third goal is that once I have $1000+ coming in, I will be able to begin to consider renting a home somewhere. For the first time since 2007. I still aim to wander, travel and make pilgrimage in the wild and holy places of the earth, but this body needs a place to rest when it is weary. Aged 56, with ME/CFS, that is not a luxury but a basic essential. It is also the reason a vehicle is needed. Later in the goals, I will move into bigger place, where I have not only space to live and work, but also land where I can offer a few small hermitage huts to visiting poets and seekers. I will offer solitary retreat time there, with guidance available from me. I may also offer something similar online, supported solitary retreat. Another goal is to upgrade a vehicle to create a mobile hermitage / zendo / tea house / poet hut. One that allows me to show up anywhere. Not too big, just a converted van of some kind, made with repurposed natural materials. Eventually, a tea house at the home/studio/hermitage too. That will complete the circle. Along the way, what I offer is exclusive access to more than 95% of my poetry, early release of ebooks and printed published books, your name in them on a list of patrons, notes from my notebook, journal entries from my journals, chapters from The Forest, which I hope to really dig into as soon as I’m able to live in a more forested environment again. I also offer poetry readings and commentaries on Zen and Zen poetry by the masters, and the ancient art of Zen divination, using a couple of my most loved Zen texts, ‘Zen Sand’ and ‘Wind in the Pines’. Zen, tea and poetry are my passions. Their principles are at the heart of all my work and activities. So there will be plenty of reference to tea too. In a nutshell, the Patreon project is to enable a community of lovers of the contemplative way of Zen, tea and poetry, those with a passion for silence, stillness and the slow life, to gather around my work. This community supports me so I can continue to share my words, and publish them more widely, it supports me to allow my trust in the ability of life to provide for me, to support the expansion and development of my work. Whether that leads to a life like Basho - roaming, writing, sharing, teaching and resting, then doing it all over again, or, like Dogen, hosting a tiny haiku zendō somewhere in the forested hills, or like Baisao the old tea seller, selling tea by the river, sharing conversation, or that old crazy cloud, Ikkyu, time will tell. Ultimately, it is what leads to this present life as Ando, and that’s good with me. When I walk or sit with nature, I meet my own heart. Find me on a mountain top, under a tree, on a rock at the foot of a gorge, in the wind in the pines. Meet me there.